- fully responsive web interface for desktop, tablet or smart phone. - alerting via email, voice call or SMS. - Web API protocols: JSON and XML. - DHCP or static IP. - PoE built-in with optional 110-230v AC, +24v or -48v DC inputs. - ultra low power usage (< 0.5W). - runs locally - no Internet connectivity required to operate. - stand-alone device: no software needed. 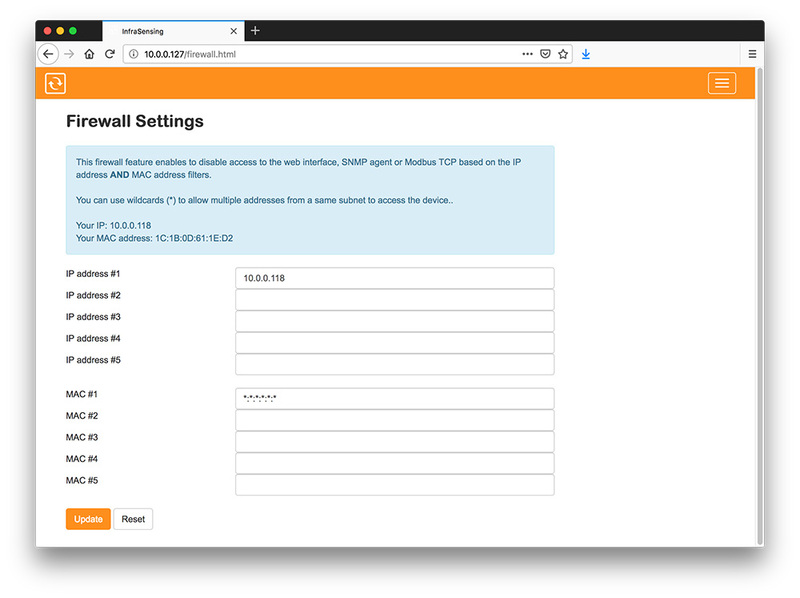 - user configurable firewall for enhanced security. - industrial grade: UL Listed, FCC and CE certified. - environmental, power, security & industrial sensors. Built-in alerting via email, SMS or voice call. Want to be alerted when thresholds are exceeded? The device can itself send out alerts via email, SMS or as a voice call. No software or PC neededed. With the optional cellular alerting add-on you can send SMS alerts through a SIM card. Data alerts (email) are sent through the mobile data network when the IP network is down. For IT people, the base unit makes it data available via SNMP. It upports SNMP v2 & v3 with following SNMP commands: GET, GETNEXT, SET, WALK & TRAPS. This feature allows you to integrate the devices with any SNMP or DCIM software. It makes the base unit by default an SNMP temperature sensor. For facility people, the protocol is Modbus TCP. This enables you to integrate the sensors with popular Building Management System (BMS). Both SNMP and Modbus TCP can be used at the same time. The device also supports integration via JSON and XML. The base unit has a built-in web server. This enables you to configure, read sensor data, define alerts and more. It is fully responsive: it works from your smart phone, tablet or desktop PC. No app needed. Simply point your browser to the IP address of the device to start managing it. Using the built-in firewall you can secure access to the base unit. Only allow connection to the base unit for the users and applications that you want. The firewall authenticates based on IP and Mac addresses. You can apply masks to it to allow a specific range. 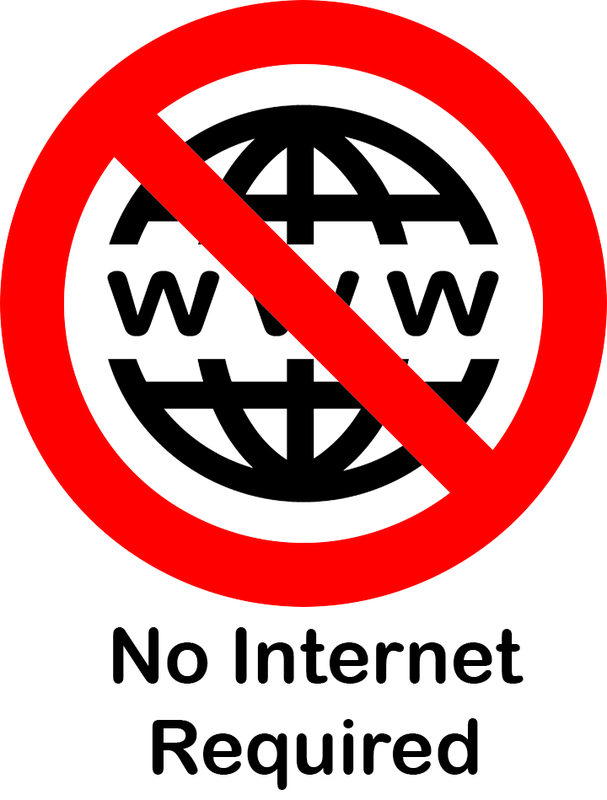 Unauthorized connections will be refused: for the built-in webserver, SNMP and Modbus TCP. 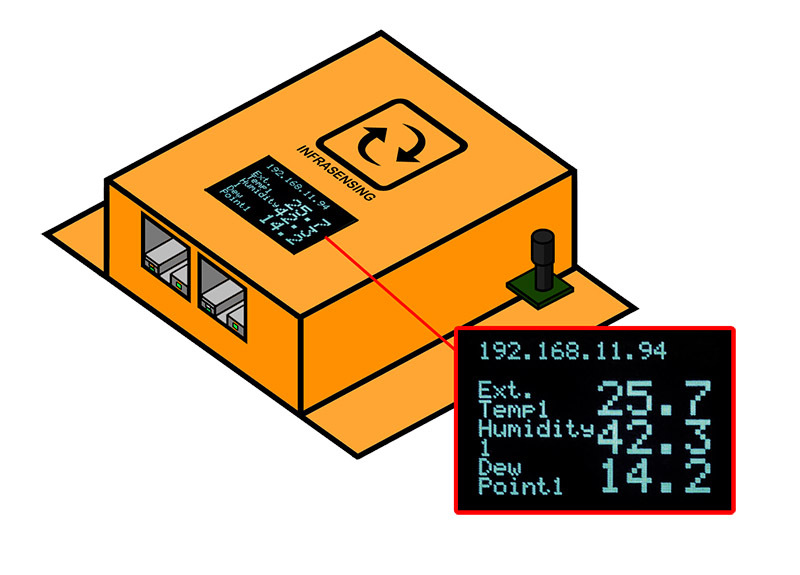 The onboard temperature sensor makes the device an SNMP, Modbus, XML and IP Ethernet temperature sensor in a box. The sensor is user calibratable to correct offset values. No PoE? With the optional BASE-PWR you can power it with a wall adapter. USB? The USB to DC power cable enables you to power the device from any 2A power source. Industrial environment? Our optional DC modules allow you to connect it to 24v power sources. Telecom usage? The -48v DC PoE injector enables you to run the sensors inside telecom rooms, cell towers and other -48v powered sites. The display shows the IP address of the device and the current values of its built-in ethernet temperature sensor and connected external probes. 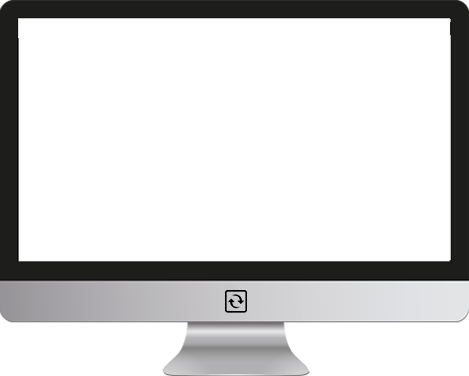 Having a display on the device is often a required feature as part of compliancy to industry standards such as ISO. Key features of the InfraSensing SensorGateway. 1) The built-in temperature sensor makes SensorGateway an ethernet temperature sensor for monitoring temperature. 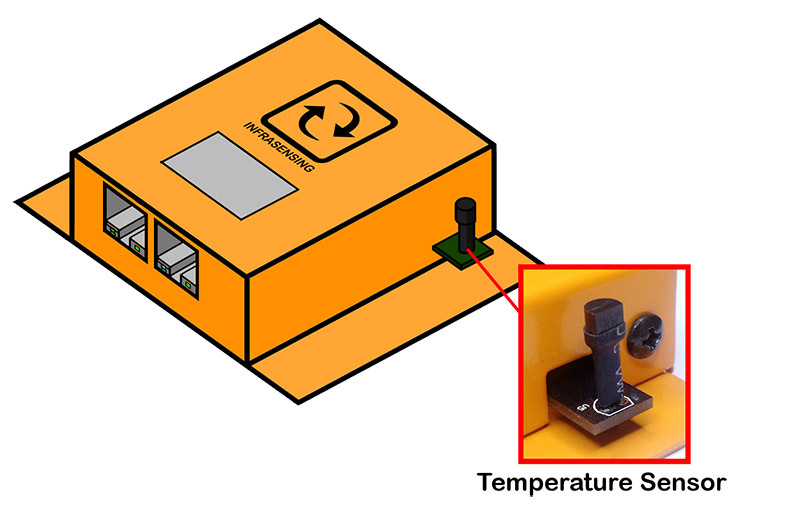 For higher accuracy, the temperature sensor is mounted outside the enclosure. 3) Power Over Ethernet: the sensors no longer require a power adapter but can be powered through the network. Compliant with the PoE IEEE 802.3af standard. No PoE? You can have them with an optional power adapter too (BASE-PWR). 4) SNMP & SNMP TRAPS: You can integrate InfraSensing's sensors with the Monitoring Software or Monitoring Appliance from ServersCheck. Using SNMP it also integrates with other management systems. 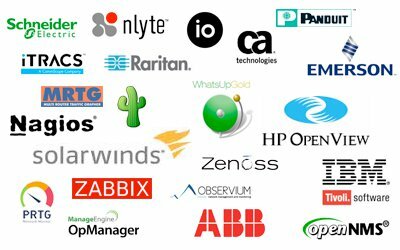 Examples are as Nagios, MRTG, Tivoli, HP OpenView, Whatsup, Ciscoworks, Big Brother, Castle Rock, OpenNMS and more... Click here to see how InfraSensing's sensors work natively with Nagios. 5) Modbus TCP: with this protocol, you can integrate the InfraSensing sensors into new Building Management Systems. This gives the facility team as well as the IT team access to the Modbus temperature sensor. 6) Industrial grade: the Sensor Gateway is made of industrial grade parts: from its steel frame to the components inside the box. 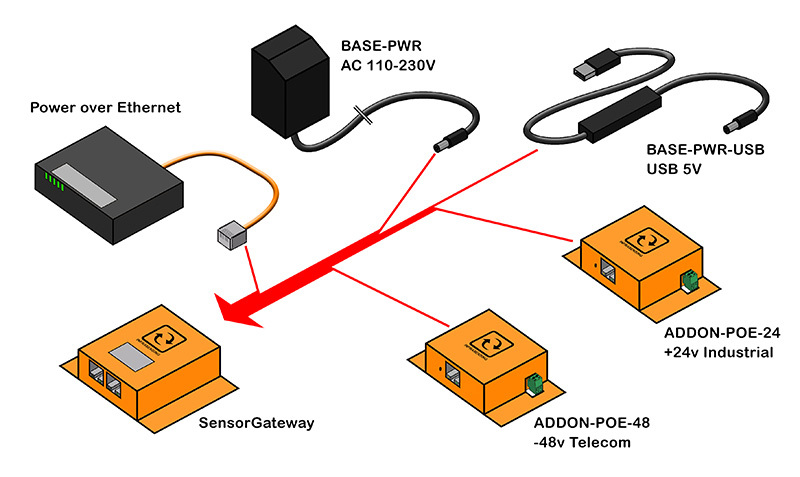 The Sensor Gateway is designed to meet the CE industrial class requirements. 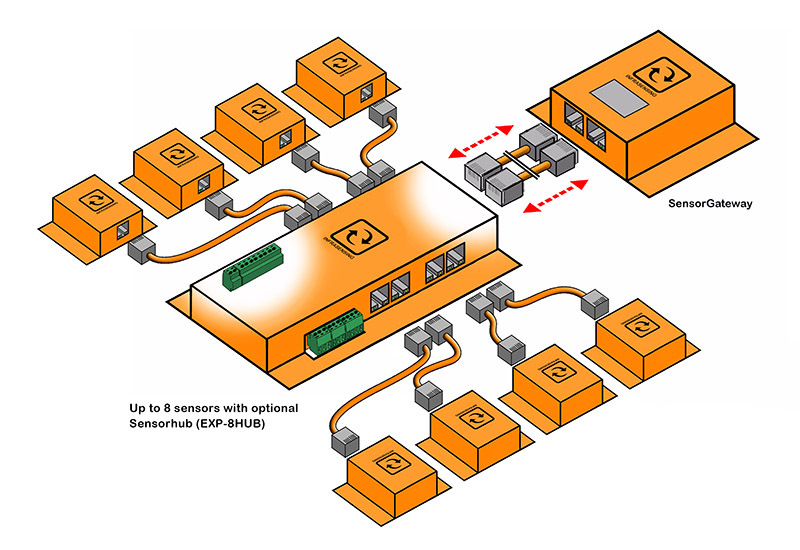 On top of the parts and needs, the Sensor Gateway has been tested to operate without problems for a minimum of 48 hours in an environment at a temperature of 75°C / 167°F. 8) Autosensing: When a sensor is connected to the SensorGateway (shown left), then the gateway will automatically detect and configure the sensor connected to it. 9) Stand-alone alerting: the sensors can autonomously generate alerts via email (SMTP) and SNMP TRAPS. 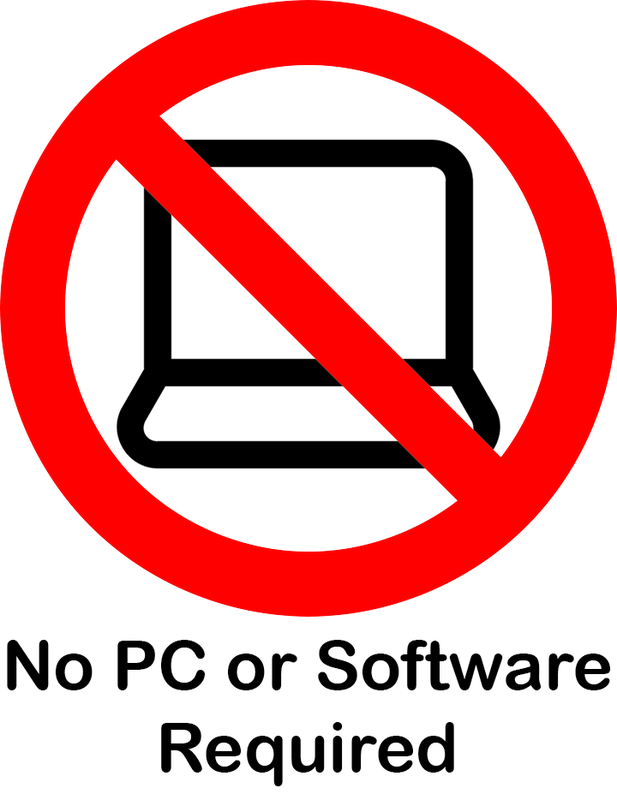 No other software needed. It doesn't take long for a damaged fan or faulty heat shield to shut your server down for good. Heat will damage motherboards and components just as fast as power surges do. Many businesses overlook the threat posed by heat damage. Statistics show that heat damage is one of the main causes of server failure. High temperatures are not the only issue. Too much change in temperature also poses a big risk to server room integrity. If the heat in your server room changes too often this can cause damage. Temperature monitors let you track and analyse changes in heat. Surge damage is a well-known source of data loss. In the same way, heat-related incidents usually involve multiple parts. This means that they can be just as bad for the safety of your data. This poses a big risk. Heat-related problems can occur at any time. There is no guarantee that your team will be standing in front of the machine when it happens. The difference between safe and excessive operating temperatures isn't that big. Temperature escalation is rapid once protection systems fail. So it is important to take a proactive stance to monitoring. There is an easy way to stay in the loop when it comes to server emergencies. InfraSensing's Ethernet and IP temperature sensors combined with its monitoring and reporting system put you in control. The average server downtime costs €5,000 per minute. No business can afford to take risks with its data. SensorGateway makes server room heat one less risk factor. Protect against downtime, data loss, and repair bills. Taking a proactive approach is key. Aside from checking for warning signs, you can get an idea of how to improve your setup. While temperature risks pose a threat, simple steps can prevent problems. Small additions like fans and panels can keep heat under control. But without the right tools, you can't monitor these changes. You need a way to make sure your improvements are working, and that things stay improved. SensorGateway is up to the task. With our device, any setup changes can be measured in detail. And you can be confident that you're prepared for any unexpected results. It sends alerts using many different methods. This way you can choose what suits your business best. The IP temperature sensor enabled base unit will detect a temperature rise above your predefined threshold. It then sends an alarm which you can get via SMS/text, email, MS-Messenger, and more. In addition to sending the alert, the higher-level monitoring systems can also execute any external process. This includes performing an orderly server shutdown. Some systems are also capable of running an HTTP GET request with pre-defined parameters. When you use an enhanced monitoring system, you not only ensure the integrity of your network. You guarantee 24/7 emergency response. Even if your data center is unmanned when the emergency occurs, and no one is available to receive the alarm. A WiFi temperature monitor like SensorGateway gives constant oversight. On top of that, it’s reliable and accurate. When heat-proofing your servers, you need a temp check that fits with your workflow. This way you can get the most from your improvement measures. And in the event of a crisis, your temp monitor should quickly show the data you need to act. SensorGateway has these bases covered. It integrates with any other sensors you might use. Guarding against heat, flooding humidity and other threats is made easy. You can monitor these risk factors from one source. In the event of an issue, your response needs to be fast and effective. The outputs of the device are also designed with response in mind. It integrates with building management and other systems. With SNMP and Modbus formats possible, the device fits how you work. This is also the case for the alerts. Speed is key in a crisis. Get alerts by email, SMS, call, and more. Never be caught out by a heat related incident. Any heat monitoring solution should fit your setup. The device can be powered in different ways. Ethernet or adaptor, whichever suits your operation. SensorGateway works with third party software so your options aren’t limited. Reliable data transfer matters in the event of a crisis. Analysis is important when guarding against heat damage. Speed and preparation are key if something does happen. The device offers protection against heat related crises. This is an overlooked risk to server integrity. Don’t be caught out by something preventable. Power failures and surges are well known threats. But heat damage remains a factor. Thankfully, it’s a problem easily solved with the right solution. It needn’t be a source of lost business. It doesn’t matter if you’re responsible for one server or one hundred. The right server room temperature monitor gives you peace of mind. You can be sure you have protected your network against temperature-related incidents. Get your sensor now.